Sonam Kapoor is now basking in the glory of her back to back successes in the form of “Ranjhaana” and “Bhaag Milkha Bhaag”. She was recently in Hyderabad for a promotional event and expressed her desire to work in Tollywood if at all she gets a challenging role like the one she has played in Ranjhaana where her character evolves throughout. Also she expressed her problem that she doesn’t know the language which is what is stopping her from accepting a role down South. Further she revealed that she has been getting lot of offers from Tollywood recently. 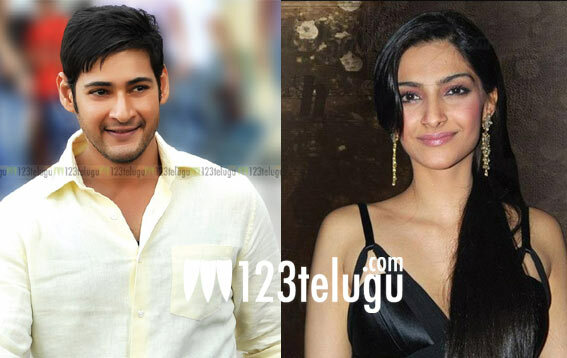 An English daily reported her saying that her dream co-star to work with in Tollywood would be Mahesh Babu and she went ahead and said that he is extremely good looking. There have been rumours doing rounds that Sonam will be cast opposite Mahesh Babu, Now that she has admitted her willingness we can hope to see the duo working together very soon.